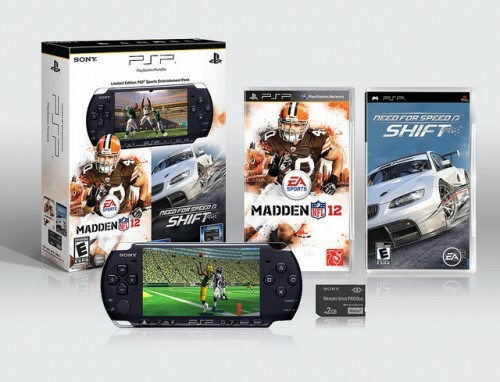 Available August 30th, Sony will introduce a new PlayStation Portable bundle featuring Madden NFL 12 and Need for Speed Shift. I know what you’re thinking. With the PlayStation Vita on the horizon, why would anyone in their right minds be interested in a PlayStation Portable at this point, no less a hardware bundle featuring Madden NFL 12 and Need for Speed Shift — but just hear me out on this one. Okay? Good. Firstly, there’s a significant amount of amazing games for the Sony handheld device that because of poor marketing shenanigans you’ve probably never played. Games like Irem’s Hammerin’ Hero or Namco’s Ridge Racers 2 (look’em up, they’re superb)– two under the radar games that pack so much fun, and most likely won’t get re-released for the Vita. Second, the PlayStation Vita won’t be out till early 2012. Remember that recent rumor going on about a 2011 Holiday release? Well, for Debbie Downer’s sake, Sony’s gone and cleared up all chatter about that, with SCEI Chairman Kaz Hirai telling reporters that the PlayStation Vita would miss the Holiday season in North America and Europe, instead now targeting a early 2012 shipping date. Apropos for all Sony hardware launches, that sounds a lot like March (could be wrong) — giving you a good 6 months or so to dive into the PSP’s long library of games that you might of missed. Plus everything you digitally purchase over the PlayStation Network for it should carry over in the case you want to upgrade to front-and-rear touchscreen bliss. Price? $159.99. For that price, its an alright PSP bundle for what you get — a solid portable, two fun games, and of course a prime back-log of titles that are absolutely worth discovering if, at this extremely late point in the game, you’ve yet to pick one up. be interested in hearing. Either way, great blog and I look forward to seeing it gow over time.